Cobblers boss Justin Edinburgh says the signing of striker Leon Lobjoit from UCL Division One outfit Buckingham Town is ‘a gamble worth taking’. 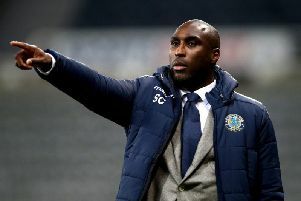 Edinburgh has previous in taking unpolished gems from non-League and making them shine, having picked up Connor Washington from another UCL team St Ives in 2012, when he was manager at Newport County. Washington had an instant impact in the professional game and went on to secure moves to Peterborough United and Queens Park Rangers, and last weekend scored for Northern Ireland in their 2-0 World Cup qualifying win over Norway at Windsor Park. And Lobjoit doesn’t have to look too far for another example of a non-League player carving out a career for themselves, as loan striker Keshi Anderson was signed by Crystal Palace after excelling for Barton Rovers and then netting a hat-trick in a trial game against the Eagles Under-23s. Lobjoit arrives at Sixfields having enjoyed a prolific spell in UCL Division One, scoring an eye-catching 62 goals in just 36 appearances for the Robins. He spent two weeks on trial at the Cobblers and scored in a reserve team friendly, and Edinburgh believes the player, who was a scholar as a teenager at MK Dons and Coventry City before dropping out of the full-time game, has got what it takes to make the step up in levels to Sky Bet League One. “It is a gamble worth taking,” said the Cobblers boss. “My belief is the size of the goal doesn’t change, and the position of it doesn’t move. “Obviously there is a step up in levels, I appreciate that, but Leon has had good grounding at MK Dons, Coventry and was on trial at QPR for a little while, but in a different position. “He was more known in his early days as being a midfield, defensive player, but he has found himself as a striker and has obviously adapted very well to that. “Everything we have seen about about him we thought was good. Asked if non-League football is an area that the Cobblers will continue to monitor, Edinburgh said it is, because players playing competitive football every weekend gives them an edge. “I have come through non-League myself as a manager, so I am fully aware of the quality at that level,” said the Town boss. “At Newport not so long ago I took Connor Washington from St Ives, for £3,000 I think it was. “That transfer kept Newport afloat in tough times when Peterborough then sold him on to QPR and Newport got the sell-on of 20 per cent, and Connor is now scoring goals for Northern Ireland. “They don’t all work out, but there plenty of players out there that are capable of doing that, and hopefully Leon can follow in the same footsteps and have the same story as Connor Washington. “I think we are always on the lookout for any talent at any level, but for me the non-League is a niche, because what you are finding is these young players are playing competitive, men’s football, week in, week out. “They understand the value of what the results business means, and they have a desire, so it is an area that we keep our eye on quite closely. “I feel they are more equipped at the present time to play competitive, first team football. “That is no fault of any academy, under-21 or under-23 player, but these guys are fully aware of what results mean, and what it takes.